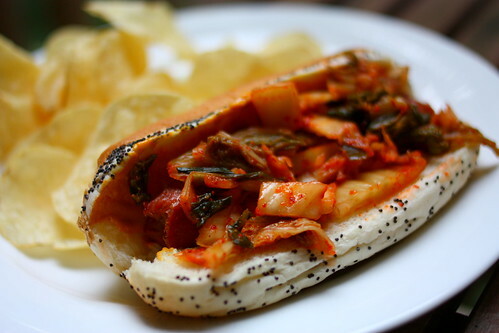 Hot dogs, kimchi and Chicago-style. Sometime late last month, I can't recall the exact day, I started getting sick of hot dogs. This is probably a common occurrence come August for most people, when summer is starting to wind down and we look at the calendar with wide eyes and start frantically filling our weekends with visits to the lake house, the fair, the beach. But for me, hot dogs aren't even just a summer food. I eat them and love them year-round, even in winter, when tomatoes are a no-no (I prefer my dog dragged through the garden, in true Chicago style) and the grill is covered in snow. I'll gladly throw a couple of hot dogs in the microwave, quickly chop up onion and tomatoes, bust out the pickles and mustard, and have dinner on the table in less than 10 minutes. Which is why we've been eating hot dogs once a week, every week around here lately, and probably why I've started getting sick of them, and why I still pencil them into our weekly menu anyway. So when hot dog night rolled around last week, instead of the usual Chicago-style, I opted for something different: kimchi. Yes, I put kimchi on my hot dog. And I liked it. And I'd eat another one, too. 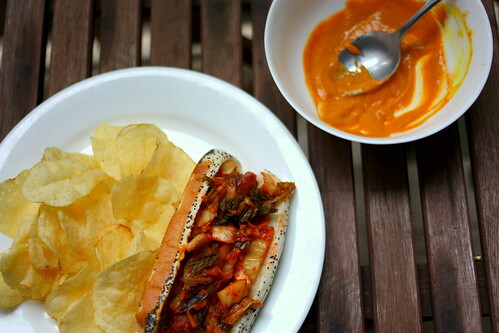 Some of you may have heard of a kimchi hot dog, and many of you probably haven't. I had never heard of it until my friend Diana gave me a recipe for kimchi hot dogs, inspired by a company called Asia Dog in New York City, that called for homemade spicy kimchi relish, spicy ketchup, jalapeno mustard and topped with crushed potato chips. Since I already had kimchi in the fridge, and I didn't have any jalapenos, I veered away from Di's recipe. Instead, I chopped up the store-bought kimchi, mixed some plain yellow mustard with Sriracha hot sauce, and piled the toppings onto an organic, grass-fed, all-beef dog nestled in a poppy seed bun. I ate two of them. If you've never had kimchi before, I wouldn't recommend putting it on a hot dog as your first experience. Get to a Korean BBQ joint, preferably with a real Korean if you know one, and try the kimchi with galbi or bulgogi or both. If you like meat, you'll like Korean food. If you like spicy, pickled vegetables, you'll like kimchi. If you like kimchi, you'll like kimchi hot dogs. If you don't like kimchi, I understand. I spent a good part of my childhood associating kimchi with stinky, spoiled cabbage. I'd scrunch my nose and make a face whenever my parents opened a jar. But tastes change, and thank goodness for that. My taste for the Chicago-style hot dog, however, will never change. I may be sick of it for now, but I'll love it always. 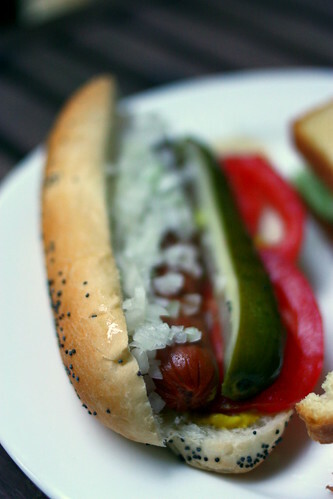 The traditional Chicago-style hot dog, according to Vienna Beef, includes the following toppings: yellow mustard, bright green relish, chopped onion, tomato wedges, one pickle spear, sport peppers, celery salt, one all-beef frank and a poppy seed bun. I skip the relish and celery salt and sometimes eat sport peppers, but only on the side. Below is my version/assembly method. Although I don't include all the traditional ingredients, I think the tomatoes, pickle and no-ketchup rule qualify mine as still completely Chicago-style. Cook your frank according to package directions. You can steam it, grill it or even microwave it. Nestle the frank in the bun, then squirt 2-3 fine lines of mustard on one side of the bun, near the bottom of the frank. Sprinkle a handful of chopped white onion over the frank, so that the majority of the onion is on the mustard-less side of the bun. Insert the tomato wedges on the mustard side of the bun. Top with pickle spear. You can buy kimchi at most Asian grocery stores. Some supermarkets may also carry kimchi -- check the refrigerated section where they keep the won ton wrappers, tofu, etc. Or you can make your own kimchi with recipes from David Lebovitz or Steamy Kitchen. For the Sriracha mustard, mix the Sriracha and mustard in a small bowl. Adjust according to tastes. Cook frank according to package direction. Nestle frank in hot dog bun. Spread Sriracha mustard on one side of the bun. Top with as much kimchi as you like. Makes 1 kimchi dog. Don't be scared. *Get a good quality, all-beef frank. I recommend Vienna Beef or Hebrew National, although for the kimchi dogs I used Applegate 100% organic grass-fed and finished all-beef franks. They're a bit more expensive but oh. so. good. **Must be Claussen. No other store-bought pickle compares. Kimchi is amazing, hot dogs are amazing, kimchi hotdogs are amazing! Regarding your loyalty to Claussen pickles you might find this taste test interesting. Claussen came in 4th!!! I have never had the top three, but this article has inspired me to seek them out. I made my own pickles for the first time last week from some cucumbers my friend's mom gave me. They turned out decent but a little too sweet and a couple too many allspice berries. I used the recipe from the Charcuterie book by Michael Ruhlman. Ooooh, the kimchi dog is a staple at my friend Tim's summer cookouts. I never remember to get the housemade kimchi when I'm at the Korean market in my neighborhood but since he lives right around the corner he always has some in the fridge. Thanks for reminding me, next time I'm there I'll pick some up! i enjoy hotdogs, but i don't eat it often. i adore kimchi and eat it even less often than hotdogs. my gentleman friend & i were at a posh cafe recently and they had hotdogs on the menu with 3 choices of style: german, korean or swiss. he went for german but i was secretly hoping for korean. must make this soon! I'll have to try these Applegate dogs. There's something about conventionally-made hot dogs and sausages that makes the ex-vegetarian in me squirm...but a grass-fed option sounds great! Nolan - Yes, yes and yes! And I can't believe Claussen didn't get #1 on that list! I've never pickled anything myself before, but I think it's something I should get into. And make more bloody marys to contain said pickled goods. Adrienne - Oh I'm glad I'm not the only one who eats kimchi dogs! I've been obsessed with kimchi lately. Maddie - The Applegate dogs are good. Murdo went as far to say they were the best he's ever had, and that man knows his franks. And yes, you should definitely try a Korean BBQ place sometime! ooh i just love this idea! gotta try this - thank you! megcjones - I hope you like them!